The Spinal Arachnoiditis Survivors need an Inspirational Song. 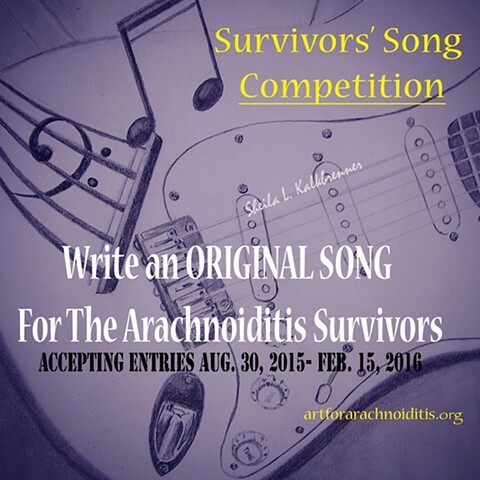 Spinal Arachnoiditis Survivors, Singers, Poets, Musicians, Songwriters, ANYONE interested in inspiring Survivors with music may submit ONE entry. After the close of the Call For Entries, Survivors will vote for the favorite entry. The winner will be notified via contact information on the registration form, then, announced on Social Media. The song will then be licensed for project use for the duration of The Art For Arachnoiditis Project. The creator will be noted publicly whenever possible (sometimes text limitations in social media platforms make this difficult, however the artists name will be listed with any video production utilizing his/her work) and maintain all ownership and copyrights to the original work. The winner receives $35 and assistance (if needed) with submitting the copyright application for the song. Please share this song search.